Former French captain Marc Cecillon - perhaps best known in England for being smashed in a tackle by Mickey Skinner in the 1991 World Cup Quarter Final - is apparently back in prison. In 2004 Cecillon, who suffered problems with alcohol and depression following his retirement from the game, was sentenced to 20 years in prison for murdering his wife, having shot her 5 times in front of guests while drunk at a barbecue. He was released on parole in 2011. 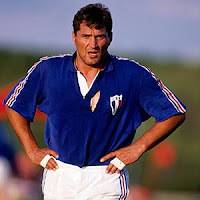 Sadly it seems as if the demons are very much still there for the former "Quiet Man" of French rugby, having now been found guilty by a Perpignan court of assault, theft of a vehicle and drunk driving during a night of violence at a vineyard last month. Cecillon is subsequently serving a 12 month jail sentence (with six months suspended). Mate, the picture you chose to illustrate your post is not Marc Cecillon, but Louis Armary, who used to play loosehead prop for France at around the same time. Error acknowledged and picture changed.